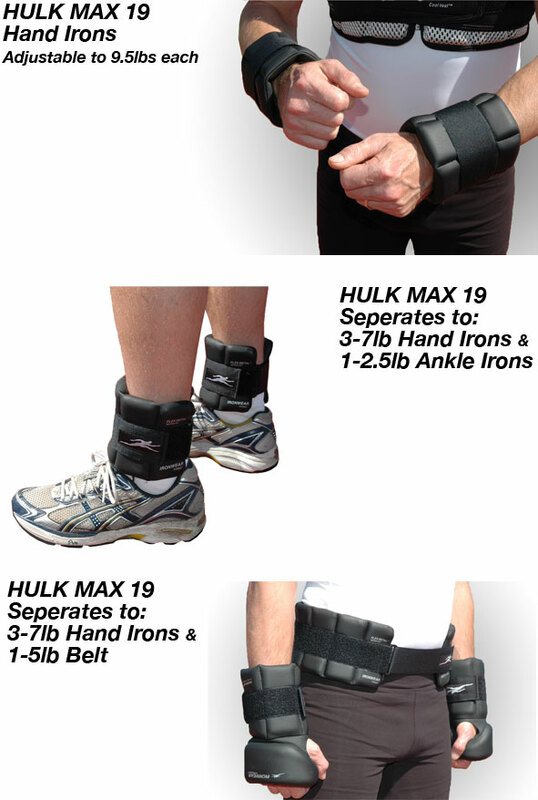 HULK MAX 19™ System™ (Adjustable Hand Irons / Belt / Ankle Weights™) Club Series 3 to 9.5 pound per hand weights (6 to 19 lb. per pair), 1-5 lb. belt, 1-2.5 lb. ankle weight system. 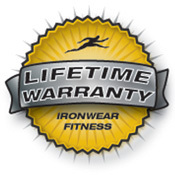 HULK MAX 19™ System™ is IRONWEAR ™’s most advanced and challenging heavy weight system. The patented HULK MAX™ System combines all the best features of Hand Irons™, Wrist Irons™, and Iron Belt™. HULK MAX 19™ System can be assembled to form HULK Hand Irons™ 7 – 9.5 lb. each (14 – 19 lbs per pair), next to the heaviest hand wrist weight system available. Or the HULK MAX™ System can be separated into the 3-7 lb. adjustable Hand-Wrist Irons™ (HWI070), and the adjustable 1-15lb Iron Belt™ (IB050A). HULK MAX 19™ System lets you quickly position the weight in different locations to work or rest different muscle groups. For example you can start off with all 19 lbs. on the arms and then quickly switch to 14 pounds on the arms and 2.5 pounds on the ankles. Then you can switch the 5 pounds to your waist to give your arms and legs a break, all the while you are still benefiting from carrying the additional weight. HULK MAX 19™ System is complete and includes enough weight for the most advanced pro athlete, but can be loaded to match your level of fitness. Start up low and as you advance you can keep adding the weights. Another great thing about the system is that you can use the Iron Belt™ to hold extra weights so that you can add or remove the weights from the Hand-Wrist Irons™ while you are out training or just walking. HULK MAX 19™ System comes with 26 – ½ lb. Flex-metal™ inserts and two 3 pound sections of IRONWEAR ™’s Flex-metal™ sculpted to the curves of the right and left hand. Together the system totals 19 pounds, that is as much weights as most heavy weighted vests. HULK MAX 19™ System includes IRONWEAR ™’s unique patented Adjustable Hand-Wrist Irons™ that have 4 pockets in each hand, each pocket can hold 2 half pound weights. With all 8 weights installed each hand, the weight is 7 pounds. With the second 2.5 lb layer laced into on to the first the total weight can be taken to 9.5 pounds per hand. HULK MAX 19™ System includes IRONWEAR ™’s unique patented Iron Belt™ which has 10 pockets that will accept one ½ lb weights per pocket for a maximum of 5 lbs. The system can also be separated into two 2.5 lb ankle, wrist or thigh weights. HULK MAX 19™ System was created for developing and experienced athletes who want to be challenged. The system offers a wide range of options for basic or intense training for all types of sports, as well as body building, boxing, karate, and kickboxing. HULK MAX 19™ System, Champion Series are IRONWEAR ™’s standard durable line of hand weights. They are covered by a stretch woven nylon fabric and rubber laminate which provides extra padding and absorbs excess sweat.